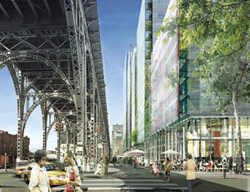 The Greater Harlem Housing Development Corporation (GHHDC), the Chamber's development subsidiary, in concert with the New York City Planning Commission and the Office of the Mayor, created the Striver's Center Development Project, which anchors the heart of the Striver's Cultural District. This urban renewal initiative extends from West 130th Street to West 141st Street from 5th Avenue to St. Nicholas Avenue and is home to restaurants, boutiques, libraries, churches, recreational facilities, cultural venues, small businesses, professional service providers and various housing options ranging from affordable apartments, co-ops, condominiums to townhouses. Some other key development initiatives that the Chamber actively supports include the redevelopment of the new Harlem Hospital Center, Columbia University's Manhattanville Project, completion of the Adam Clayton Powell Jr. State Office Building Plaza, the continued revitalization of 125th Street led by the 125th Street Business Improvement District, new construction projects at The City College of New York, the development by the Harlem Community Development Corporation of the Victoria complex (hotel, cultural, residential) and the newly completed Clara Hale MTA Bus Depot to name a few.